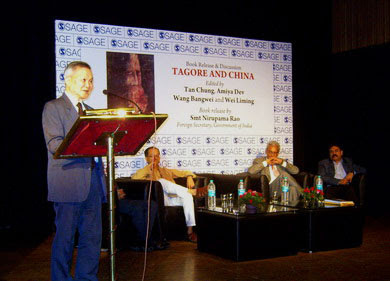 On May 12, 2011, Chinese ambassador Zhang Yan attended the launch of the new book Tagore and China hold in Alliance Francaise de Delhi. Chinese Indian scholar Tan Chung, Special Secretary of the Ministry of External Affairs in charge of public diplomacy Jayant Prasad, publisher of the book and other experts and academicians all in total over 100 people also took part in this event. In his remarks, ambassador Zhang congratulated the publishing of the book. He indicated that Tagore is a well known and influential Indian litterateur in China. Several activities have been held in China in commemorative of Tagore's 150 years birth anniversary. Tagore has made great contributions to the mutual understanding and cultural exchanges of China and India. Mr. Tan Chung gave a briefing of the book and a retrospection of Tagore and his visits to China. The book, which collected articles and essays about Tagore by both Chinese and Indian scholars, was published by Sage Publications, and edited by: TAN CHUNG , AMIYA DEV , WANG BANGWEI and WEI LIMING ( Peking University, Beijing, China ) . 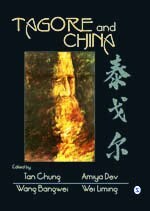 Published : May 2011 , Pages : 420 Size : Crown: 7" x 10"
Tagore and China is the first full account in English of Rabindranath Tagore’s visit to China and its civilizational import. Perhaps for the first time, exhaustive material related to the visit has been collected. The book charts Tagore’s ‘grand visit’ in 1924 undertaken in response to China’s ‘Tagore fever’ and the series of talks he gave there, their antecedents as well as impact. Also discussed is the foundation of Cheena-Bhavana at Visva-Bharati—and thereby of Chinese studies in India—and Tan Yun-shan’s lifelong dedication to it and the Sino-Indian love it held. This well-researched book unearths new material from Chinese sources to confirm the devotion of Tagore’s interpreter, poet Xu Zhimo, to him and Tagore’s affection for Xu Zhimo. Tagore’s two personal visits to Xu Zhimo, preceded by the latter’s visit to Santiniketan, have also been detailed. Supplemented by several rare photographs, Tagore and China is a fitting tribute to Tagore’s 150th birth anniversary and is going to be of abiding value to Sino-Indian understanding. Immediately after his birth in April 1929 in Malaya, Tan Chung was carried by his mother and aunt to Santiniketan to be shown to his father, Prof. Tan Yun-shan ( Tan Yunshan was the Founding Director of the Department of Chinese Language and Culture "Cheena-Bhavana" at Visva-Bharati University, Santiniketan) . Gurudeva Rabindranath Tagore was glad to see the baby and christened him “Asoka” --- the Bengali name, Tan Chung could, unfortunately, never use. Tan Chung returned to Malaya(now Malaysia)with his mother who was the principal of the Aiqun Girls’ School at Batu Bahar. He was then raised in China from 1931 to 1954. He came to India to be united with his parents and studied at Santiniketan from 1955 to 1958. He then started his career teaching Chinese language in India from 1958 to 1994 continuously in the National Defense Academy (Khadakvasla), School of Foreign Languages of the Ministry of Defense (New Delhi), Delhi University and Jawaharlal Nehru University. He also taught Chinese history at Delhi University from 1971 to 1979. Tan Chung has published ten books in English and six books in Chinese. His 'China and the Brave New World', published in 1978, 'Triton and Dragon', published in 1985, and 'Dunhuang Art', published in 1994, are used as reference books for university students in India,USA,Taipei, and Hong Kong. 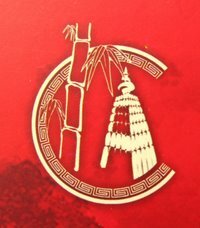 His 'India and China: Twenty Centuries of Civilizational Interaction and Vibrations', co-authored with Professor Geng Yinzeng of Peking University, is Part 6 of Volume III of the series of History of Science, Philosophy and Culture in Indian Civilization, published by Centre for Studies in Civilizations, New Delhi. His 16th book is 'Rise of the Asian Giants: Dragon-Elephant Tango'（2008,Anthem Press). His 17th book 'Tagore and China' has just been released . Tan Chung has been active in developing Chinese studies in India in various capacities as the Head of Chinese and Japanese Studies of Delhi University, Chairperson of the Centre for Afro-Asian Languages and of the Centre for East Asian Languages of Jawaharlal Nehru University. He helped create the unit of East Asian Studies in the Indira Gandhi National Centre for the Arts (New Delhi) when he was Professor-Consultant there from 1990 to 1999. He was the founder Co-Chairperson of the Institute of Chinese Studies ( Delhi ) from 1990 to 2002. He guest edited a special issue on 'India and China' for the Indian Horizon, the journal of the Indian Council for Cultural Relations in 1994. He has been the Honorary Consultant of the Editorial Board of The Selected Books of Oriental Cultures, Beijing , from 1996 to date. He popularized the concept of 'Chindia' in China, and brought out the Chinese language book, Chindia --- Idealism and Realization in 2007. Tan Chung is the recipient of Padma Bhushan award in 2010. To get the most from the fruits and vegetables, by using the twin gear juicer, you will have the benefit of eating the nutrition provided by fruits and vegetables. of the eye from oxidative damage. If you wish to use flowers, glass vases, or candles, albeit with a twist, you can think about innovative designs and arrangements to make your reception table stand out in the crowd. or select a trio of books. The ribbons are either pinned at the backside of the cake or affixed with a display bow in the front. If you're in love with your invitations and stationary then this is the cake trend for you. Wings and Wheels-this birthday cake idea will really move your child. black wrought iron frame and beside tables to match. discover the method can be a delight instead than a chore. any time in the year, is to compare costs across the board. complete home decoration products listings and a suitable deal can be cracked on cheap rates. I have read this post and if I may I want to suggest you some fascinating issues or tips. to be running off the screen in Chrome. I'm not sure if this is a formatting issue or something to do with internet browser compatibility but I figured I'd post to let you know. screen in Safari. I'm not sure if this is a format issue or something to do with internet browser compatibility but I figured I'd post to let you know. Greetings! I've been following your blog for a while now and finally got the bravery to go ahead and give you a shout out from Huffman Texas! Just wanted to mention keep up the great work! What i do not understood is if truth be told how you are now not really a lot more smartly-appreciated than you might be right now. angles. Its like women and men aren't fascinated unless it's something to do with Girl gaga! It's really very complex in this active life to listen news on Television, thus I simply use world wide web for that reason, and obtain the newest information.